Established in 1999, APACHE is known for its high-quality, no-nonsense brand of safety workwear and footwear. Designed in the UK and manufactured by experts in the Far East, the innovative products combine stylish design with technical innovation. This ensures that customers can rely on enhanced safety in the workplace while looking good in their protective gear. All products created by APACHE Industrial Workwear are thoroughly researched and tested before the manufacturing process commences. Suitable for all trades, the APACHE brand of products includes work trousers, work jackets and tops, safety glasses, safety trainers and safety boots. Safety-wear features include durable knee pad pockets in trousers, which can be positioned flexibly, and a triple-stitched inside leg seam to withstand everyday wear and tear in industrial environments. Multi-purpose utility pockets allow for convenient storage and portability of tools. Jackets are water resistant and lined for comfort while tops are made from breathable material with reinforced arms. Their ergonomically designed footwear is flexible and lightweight, providing enhanced comfort when working. Underfoot protection is given to keep feet protected against hazards on the ground. Steel toe caps, water-resistant designs and moisture wicking lining are also features of the renowned APACHE workwear and footwear ranges. 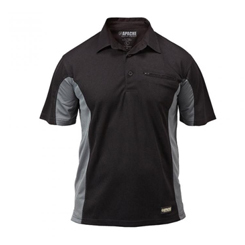 Have a question about our workwear range? Call our team on 01707 277796 and we‘ll be happy to help. Alternatively you can click here to send us a message.